*Article with more photos can be seen on MEXCONNECT. She is known by many names: The Mestiza Madonna; La Virgen Ranchera; The Empress of the Americas; Mystical Rose; the list goes on. No matter what she is called, one thing is for sure: the beloved Virgin of Guadalupe is the mother of all Mexicans. 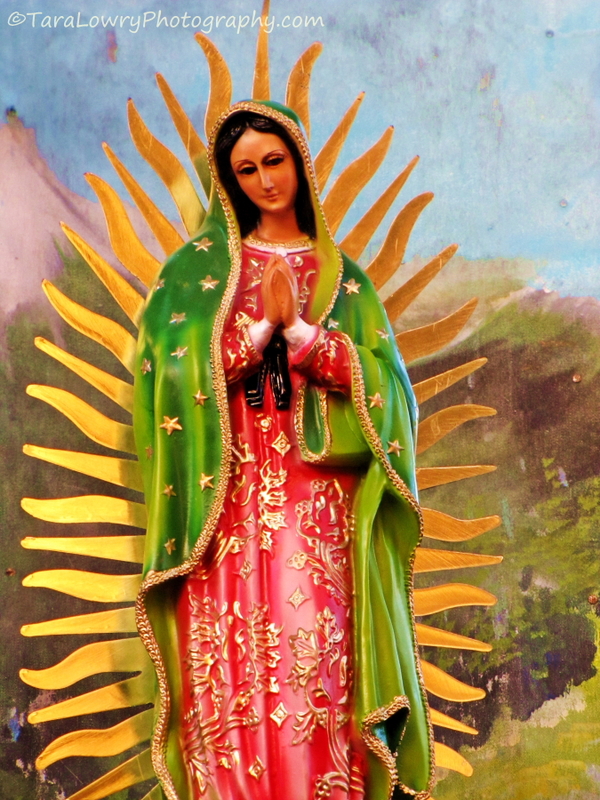 According to belief, a beautiful dark woman dressed in a blue-green mantle and rose-coloured dress declared herself as the Holy Virgin, speaking to Diego in his native language of Nahuatl. She instructed him to go to the bishop of Mexico and ask that a ‘teocalla’ or shrine be constructed in her name. Cuauhtlatoatzin went to the church and told of his experience and the Virgin’s request. The bishop discounted his story and sent him away. Undeterred, he returned a few days later on December 12th with Castilian roses that ‘La Morenita’ had urged him to gather. Upon receiving the flowers, which were out of season and not grown in that region, the bishop was astounded to see that the roses, wrapped loosely in Diego’s cloak, had turned into the image of the immaculate virgin right before his eyes and imprinted onto the cloth. This was proof enough. 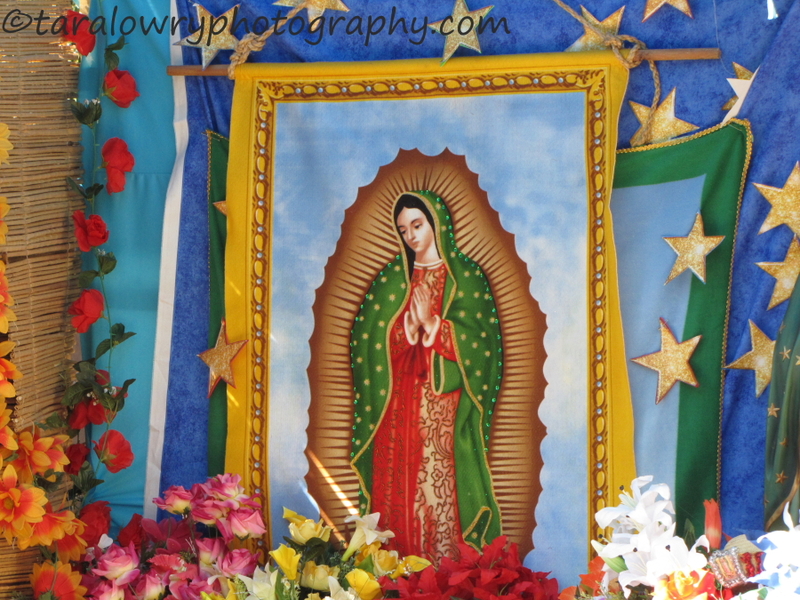 Lady Guadalupe’s shrine was built and she became the patroness of Mexico. To the Nahuatl people who had recently been conquered by the Spanish and were in the process of being converted into Catholicism, Guadalupe was a literal Godsend. Feeling orphaned and disoriented by the destruction of their own beliefs and sacred places, they embraced her with open arms. Her arrival on the very site of the fallen Aztec temple of Tonantzin (The goddess known as Mother Earth) was a true miracle. Her presence renewed the spirit of the indigenous people and her physical characteristics, which seemed to be a mix of the Virgin Mary and the Aztec Goddess Tonantzin, symbolized a new beginning for the emerging Mexican mestizo race. She was neither European nor Aztec but a divine combination of the two. In modern day Mexico, not only is Lady Guadalupe omnipresent in spirit but her likeness is seen in nearly every aspect of daily life. 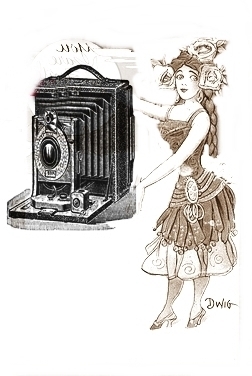 Reproduced on tile, tin, paper, clay, glass, candy, and clothing, her image is deeply incorporated into Mexican life. In cantinas she watches over the inebriated; smiling patiently, nestled amongst bottles of mescal and tequila. She overlooks the kitchens, taking in the scents of fresh mole and chocolate and listens openly to the dreams and sorrows of the cocineras (cooks). She is the co-pilot in cars, trucks, airplanes, boats and bicycles, dangling good naturedly from rear view mirrors, steering wheels and handlebars like a sacred acrobat. School children carry her with them on their backpacks and notebooks; she is their ‘virgencita,’ the one they whisper their childish hopes and heartaches to. On December 12th; the anniversary of her miraculous sign to the bishop, devout followers flock to the cathedrals of her namesake, located in nearly every city. Thousands upon thousands of devotees, arriving by bicycle, by foot and some even on their knees, make their way to the Basilica of Guadalupe just north of Mexico City. This is near the original spot where Juan Diego and the Virgin had their first meeting. They bring her flowers and gifts and ask for personal miracles, thank her for ones already granted or just pay homage. 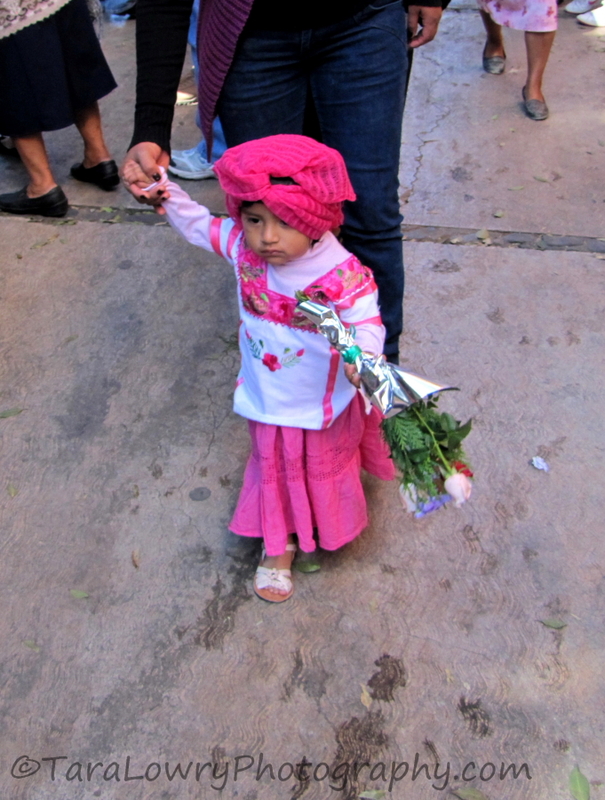 In Oaxaca, the faithful take their most beloved treasures- their children, and adorn them in the traditional dress of the various indigenous groups of Mexico. The pilgrimage begins at the cathedral in the zocalo (Main Square) and winds its way through the cobbled streets, accompanied by singing, prayers and firecrackers. When it reaches the entrance of the cathedral dedicated to ‘Nuestra Señora Guadalupe’ in Llano Park, the procession lines up to introduce their niños and niñas to the Lady herself- or at least a statue of her. Llano Park is a clutter of burros, roses, and poinsettias. 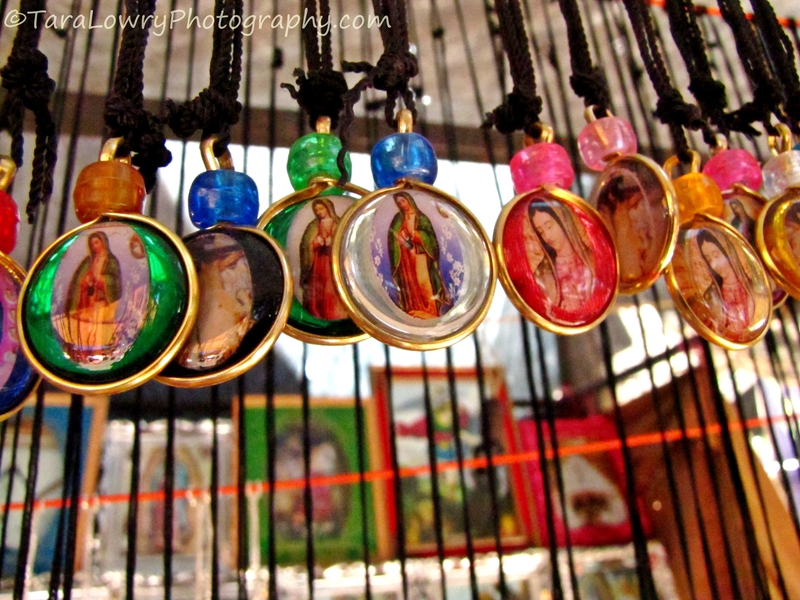 Trinkets of all kind, graced with the image of the beautiful Virgin, shine in the hot Mexican sun, waiting to be taken home as a memento of the special day. 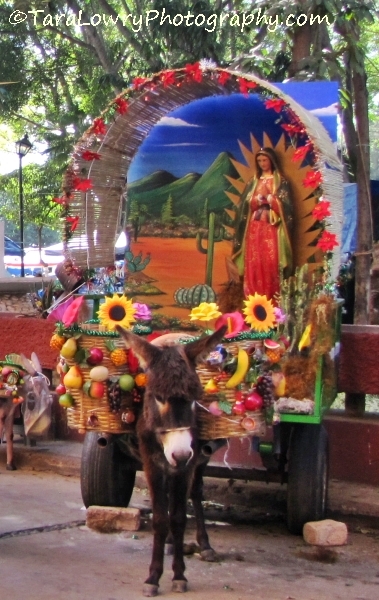 Photographers offer improvised portrait stalls, complete with fruit laden donkey carts (with real or wooden donkeys) and of course some form of the Virgin of Guadalupe, whether it is a sculpture, a framed painting or even a real woman dressed in costume. 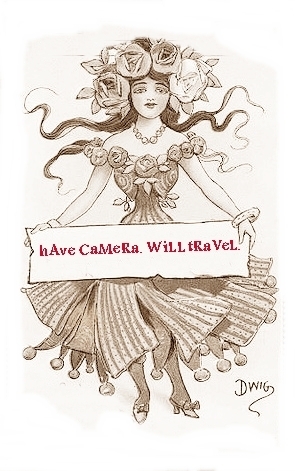 The commemorative photos taken will likely still be on display when the babes are in their 30’s so every ribbon laced braid and palm brimmed hat must be in place. Most of the tiny pilgrims, many under the age of five, seem to understand the importance of the day. The little girls calmly follow their parent’s lead, shimmering in their beads and bows and gleaming braids. 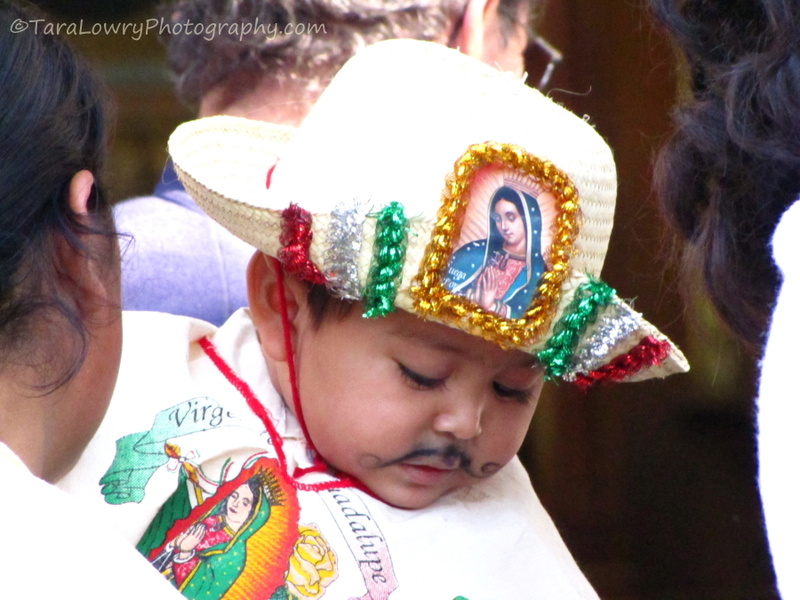 The little boys push back their Juan Diego-esque sombreros to wipe droplets of sweat off their tiny brows. Their painted on mustaches, a little off kilter and smudged, give a comical air to their serious expressions. The only commotion is when a long suffering donkey loses its patience and fills the park with a loud, complaining bray. The tot on its back lets out a terrified wail which mixes with amused chuckles from the crowd. Meanwhile on the steps leading to the church, La Virgen de Guadalupe; The Dark Queen of the Americas; The Compassionate Mother to All, in statuesque elegance continues to patiently receive each child and parent with her Mona Lisa smile, filling their lives with hope, security and peace for another year. 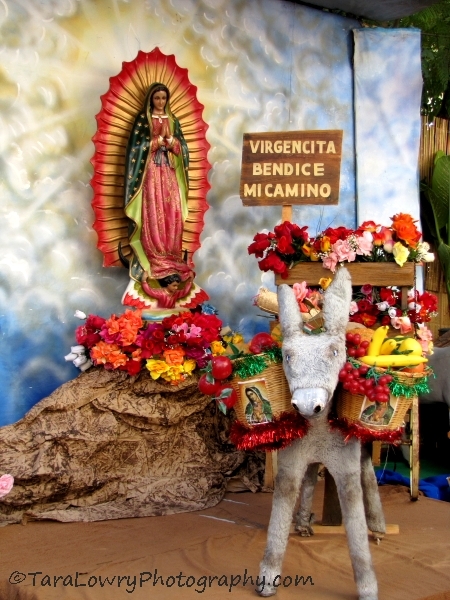 A really nice overview of La Virgin de la Guadalupe!